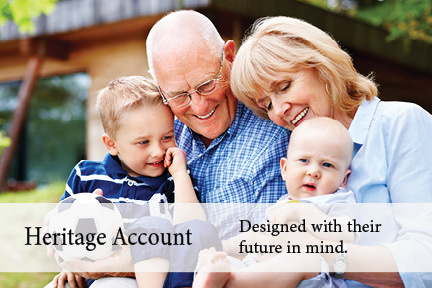 The Heritage Account is a long-term, add-on CD designed with their future in mind. The interest rate is variable and paid semi-annually. Just like a savings bond, but without the hassles of purchasing online. The account is open in the child or beneficiary’s name. Contribute to the account at any time. Early withdrawal penalty is waived after the child’s 18th birthday. Visit with a Personal Banker about our Heritage CD. It is never too late to start saving. Even the smallest amount can help them Dream Big! A penalty of early withdrawal is equal to 12-month interest. Early withdrawal penalty will be waived once account owner is 18 years old.